On Friday, we'll all be talking about the jewels of the young Queen Elizabeth II when The Crown premieres on Netflix. 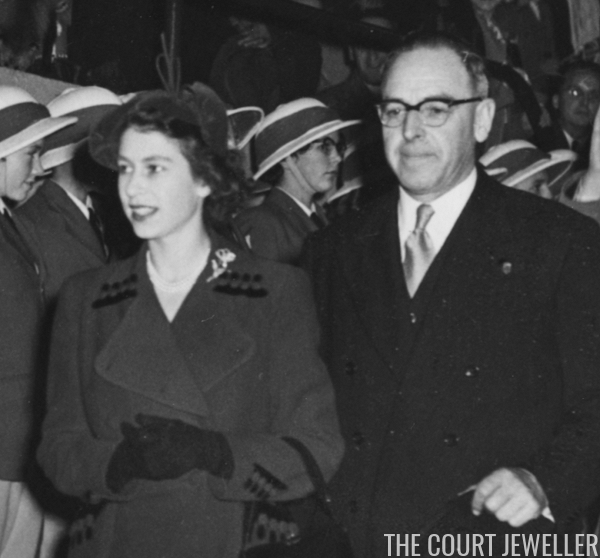 We've already chatted about the jewels from the trailer in this post and this one, but to get us in the right frame of mind, here's a look at some of the jewelry worn by Princess Elizabeth in the years before she became Britain's queen. 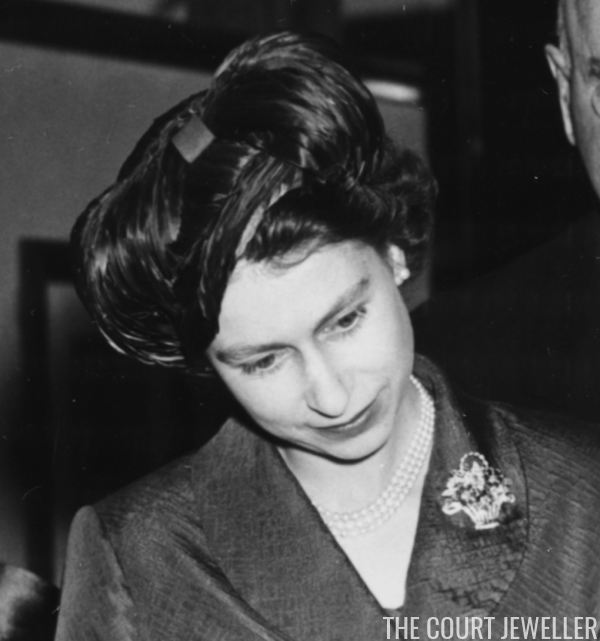 One of Elizabeth's earliest major jewelry acquisitions was the Sapphire Chrysanthemum Brooch, which she received to commemorate her launching of the British Princess, an oil tanker, in 1946. 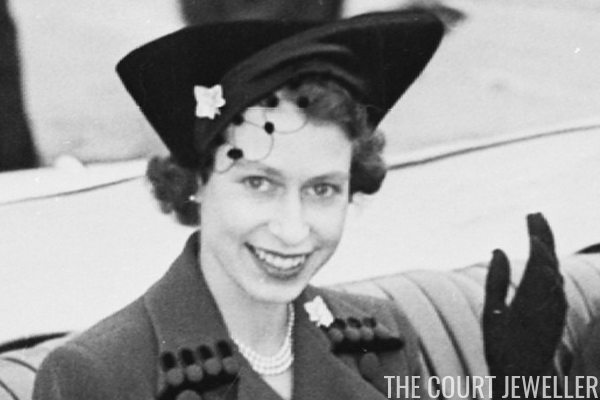 The princess was famously photographed in the platinum, diamond, and sapphire brooch during her honeymoon; she also wore it for Princess Anne's christening. Elizabeth chose three pieces of jewelry from her wedding gift haul for one of her early formal portraits as the Duchess of Edinburgh. Her tiara is the Cartier floral diadem that she chose from the company's stock on the direction of the Nizam of Hyderabad; it was later dismantled. She also wears the ruby and diamond necklace made by Boucheron in 1907 for Mrs. Greville. It was left to the Queen Mother with the rest of the Greville bequest, and Elizabeth received it as a wedding gift from her parents. The ruby and diamond bracelet on Elizabeth's right arm features a distinctive Rose of York design. It was given to Queen Mary in 1893 as a wedding present by the people of Cornwall, and Mary passed it along to Elizabeth as a wedding present in 1947. Elizabeth dipped into her stash of wedding gifts again in 1951 for a concert at Festival Hall. She wore the top portion of the Girls of Great Britain and Ireland Tiara, a wedding gift from her grandmother, Queen Mary. 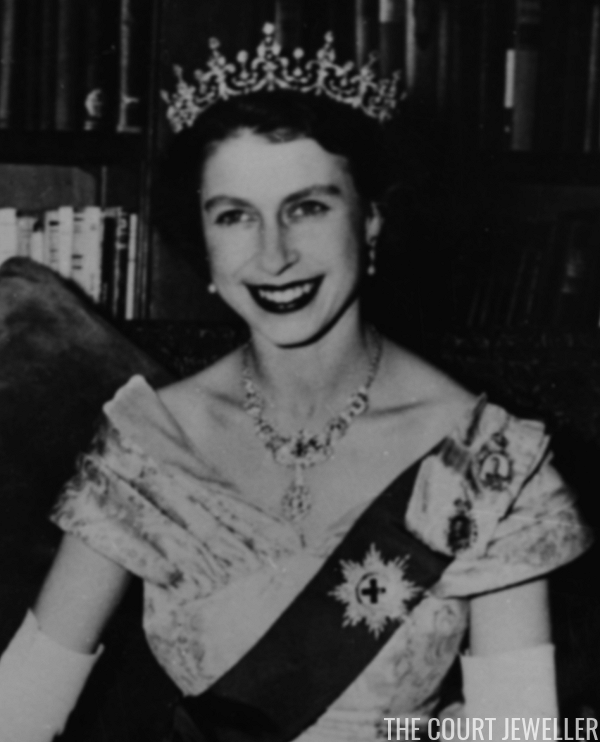 (Mary also gave Elizabeth the bandeau base of the tiara, but she didn't wear them together until the '60s.) 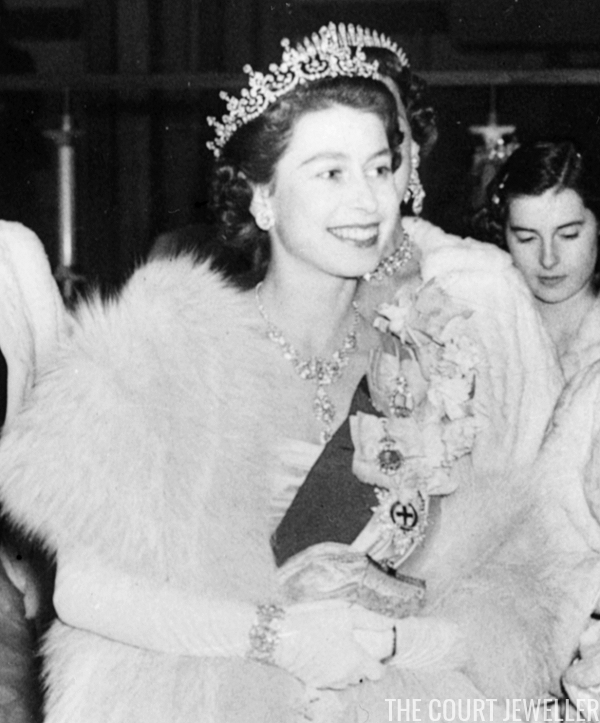 She paired the tiara with yet another wedding gift: the necklace from the Nizam of Hyderabad Suite. Behind her, you get a glimpse of another bejeweled royal: Princess Marina, Duchess of Kent, who is wearing her diamond fringe tiara and her diamond girandole earrings. Along with her mother, Elizabeth attended the wedding of the Duchess of Gloucester's niece at Westminster Abbey. She chose one of her largest brooches: the Dorset Bow Brooch. The diamond, gold, and silver brooch was made by Carrington in 1893; it was given to Queen Mary as a wedding present by the county of Dorset. 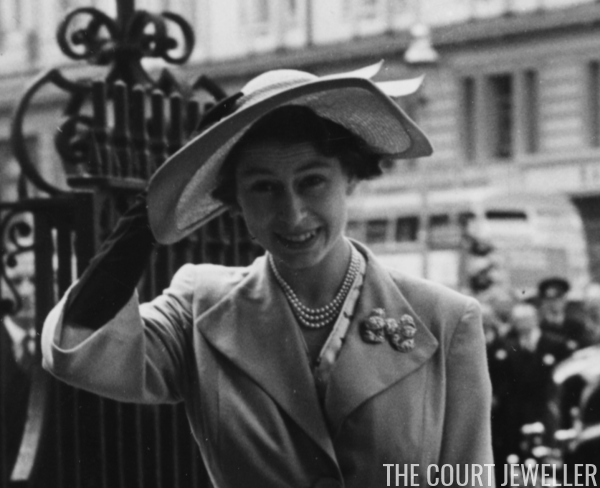 Mary gave the brooch to Elizabeth as a wedding present in 1947. In her last year as a princess, Elizabeth embarked on a month-long tour of Canada with Prince Philip. In Ottawa, she wore a brooch that has major sentimental . Elizabeth's parents gave her the Flower Basket Brooch, which is set with diamonds, sapphires, rubies, and emeralds, to mark Prince Charles's birth in November 1948. She wore it for Charles's first official photos -- and then six decades later, she wore it for the christening of Charles's first grandchild, Prince George. Elizabeth and Philip made a quick detour to visit President Truman in Washington, D.C. during the Canadian tour. On her arrival at the airport, Elizabeth wore a pair of diamond ivy leaf clips. 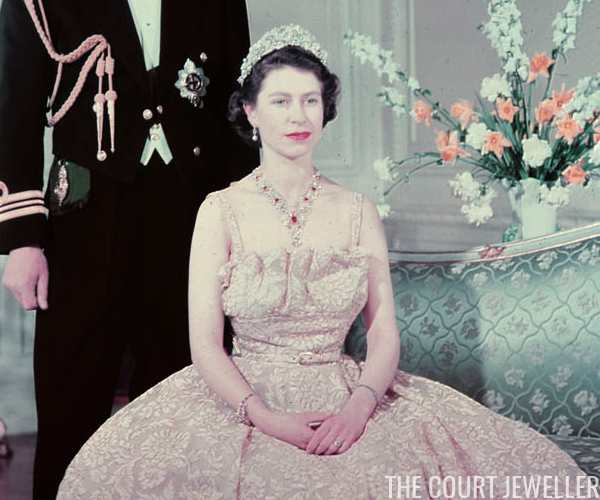 The brooches were made by Cartier and were a part of the Greville bequest to the Queen Mother. 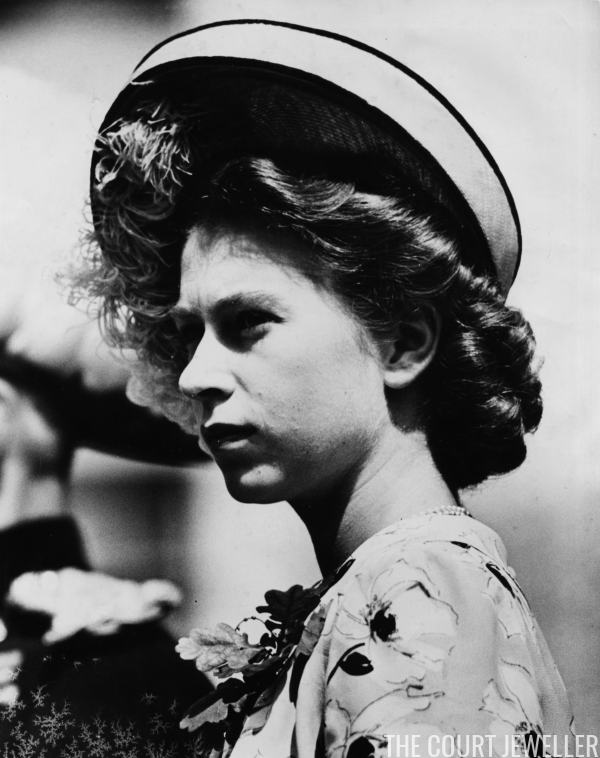 In turn, she presented them to Elizabeth on her twenty-first birthday in 1944. Elizabeth attended a glittering dinner at the Canadian embassy during the Washington visit. She was photographed in two of her wedding gifts: the Girls of Great Britain and Ireland Tiara and the Nizam of Hyderabad Necklace. Her orders also take center stage in the photo: the Garter sash and star, plus the family orders of her grandfather and her father. Near the end of the Canadian tour, Elizabeth wore the Flame Lily Brooch in Nova Scotia. She received the diamond brooch as a twenty-first birthday gift from the children of Rhodesia (now Zimbabwe). Historical hindsight is a funny thing. 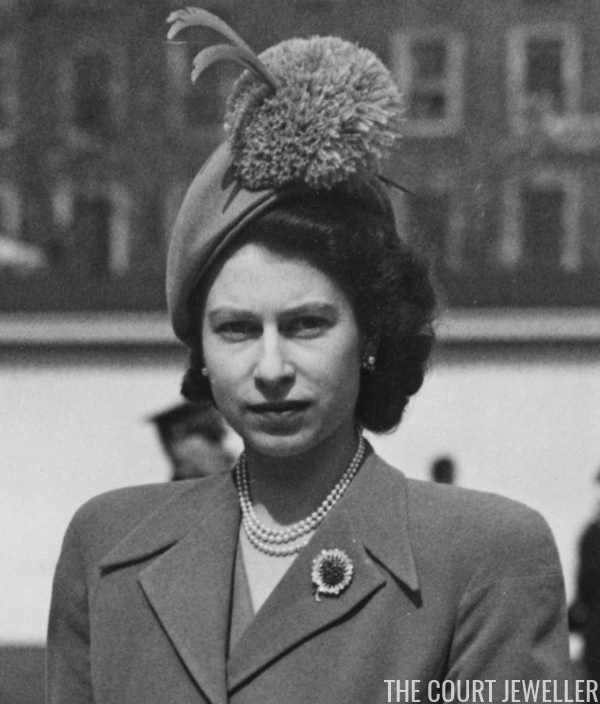 In February 1952, Elizabeth learned that her father had died, and she was now queen, while on a visit to Kenya. She flew back to Britain immediately, and as she stepped off the plane as monarch, she was wearing this brooch. So much can change in only a few weeks' time!